I have been using CCleaner software for quite some time now, and I never thought to change that software to some thing else till now. Because of its features and options. But when I see this JetClean software, I thought to give it a try. After installing that software, I immediately uninstalled the CCleaner software. Yes, Jetclean comes with lot more options, powerful features compared to ccleaner and that made me to uninstall ccleaner. Like many other free software, Jetclean also comes with toolbar, extensions and changes browser home page. 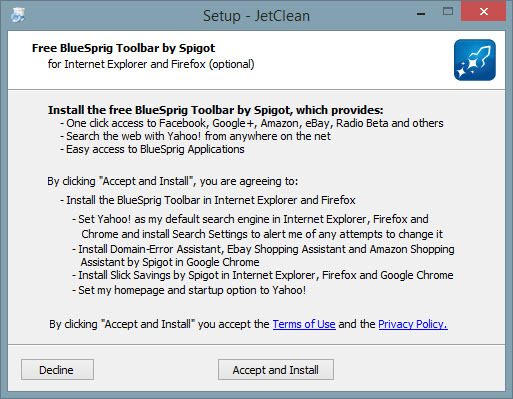 To avoid all such things- Just click Decline button when you see “Free BlueSprig Toolbar by Spigot” during installation wizard. Jetclean is a free PC cleaning utility. It almost similar to ccleaner software, but it has more features. With this software you can easily clean junk files in your PC by just one click and improve your PC performance. Jetclean not only comes with pc cleaning tool, it has many more options in one place. It mainly have 3 tabs, that is 1-Click, Tools and Settings. If click on any of those option you will see even more option to customize it. But usually we don’t need to change any of those default configuration. Once you click Scan Now button, it will start scanning process and shows the number of problems it can fix. You can also see the problem it has found. After scanning it will shows Repair option to fix all those problems. You can fix all those problem in just one click. You don’t need to worry about anything else, because it automatically takes backup of every changes made by jetclean software. Do you need better than this feature? Want to know System configuration? don’t worry. In jetclean you can easily see the system information. If you want to export all the configuration details, then click Export button which appears at the top, and it will export all the system information in html format. In Uninstaller you can check and uninstall-toolbar which is installed, recently installed programs, large programs and windows updates. If your PC taking lot of time to boot up then you can manage your start up programs in Startup optimization option. Registry Defrag and Internet Booster doesn’t comes with free version. Performance Booster: You can boost your computer performance for a particular time-like when you are playing high end game which requires lot of performance. 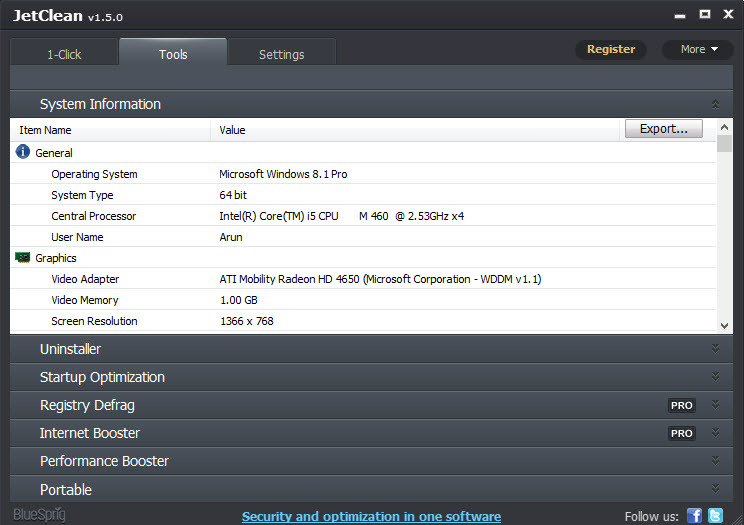 In this option it temporarily shutdown some process, services and tweaks PC to perform better. Portable: Here you get an option to generate portable version of Jetclean software. In settings tab you generally find some settings options. One of the most important feature you can see here is, Rescue option. 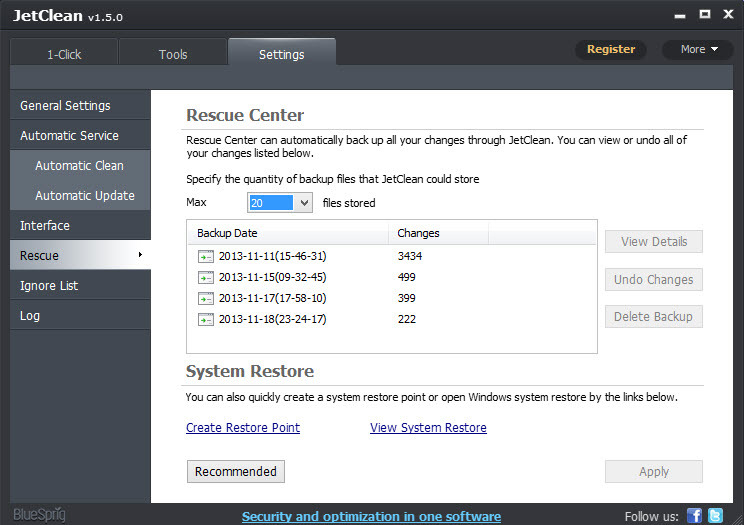 If your PC goes wrong after using Jetclean software, then can always revert the changes in rescue tab. You can also create Restore Point. Which is also one of the best way to recover PC if something goes wrong. I recommend you to create restore point before using Jetclean for the first time. One more option you can try in settings is, Ignore List. Here in that option you can explicitly specify some cookie to keep when you run 1-click clean option. If you are using CCleaner or any such PC cleaning utility program, then I recommend you to try this Jetclean software. It really having lot of useful features. Even if you don’t have any PC cleaning software, do try this software. You will definitely find something different after using it.